Ahead of the Derby della Madonnina this weekend, AC Milan and Inter are reportedly also set to clash off the pitch too over shared transfer targets. 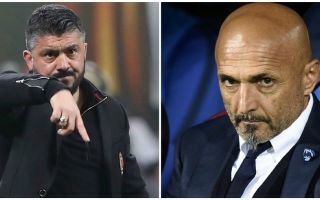 The two Milan giants will face off on Sunday night in a highly-anticipated encounter which can be watched with an Inter v AC Milan Live Stream, with Gennaro Gattuso and Luciano Spalletti hoping to get the better of each other. Given the recent form of both sides, it promises to be an entertaining and thrilling showdown, but it appears as though they will be crossing paths in the transfer market next year too as they reportedly fight for the same targets. According to Calciomercato, both Cagliari starlet Nicolo Barella and Man Utd forward Anthony Martial are wanted by both clubs. While the former is said to be valued at around €40m, Martial could end up costing the Red Devils up to €80m with various bonuses and so United will surely want to get back their investment. Given the Frenchman is still only 22 with his entire career ahead of him, it would be no surprise if he did have a hefty price-tag, albeit with his current contract set to expire next summer, United will need to address that first in order to strengthen their position to demand such a high fee. From Milan’s perspective, both would arguably be welcomed with open arms by Gattuso. As he continues to rely heavily on his preferred midfield trio of Giacomo Bonaventura, Lucas Biglia and Franck Kessie, the Italian tactician will surely need more quality and depth moving forward to compete on various fronts. Barella could certainly address that problem. Meanwhile, although he did see Samu Castillejo arrive this past summer to bolster his options on the wings, Milan still perhaps miss something in that department. Further, with Martial’s ability to play up front, he could be another option alongside Gonzalo Higuain and Patrick Cutrone up top if needed as Milan are light there too. In turn, time will tell if the Rossoneri can beat their rivals both on and off the pitch this weekend onwards.